What a horrible few days. I still can’t quite believe that the UK has done something so crazy. I’m shocked and devastated at the catastrophic decision made by the British electorate on Thursday. I keep hoping that the whole thing will turn out to be like Bobby Ewing’s “death” on Dallas – that we’ll wake up in a few days time and find that the whole sorry mess is a dream/nightmare. My Europhile husband is probably more appalled by the referendum result than anyone, not least because he’s spent the last 12 years running tech start-ups that depend on – and employ – talented European colleagues. The day after the referendum result was his birthday though – so we decided to do something different to lighten the gloom. My solution was to take him on a magical mystery tour through the country lanes of Dorset for a birthday lunch at Brassica, a restaurant I’d been meaning to visit for ages. As we left Dorchester and headed towards Beaminster the countryside had never looked more beautiful, the roads lined with clouds of cow parsley and pretty stone cottages unchanged by time. We half expected to see Gabriel Oak herding his sheep across the lush green fields. Finally we got there and what a delight it was. Brassica occupies a corner of the pretty town square, where despite the threat of rain, cheery locals were busy setting up for the start of the annual Beaminster Festival. With its chic steel grey frontage the restaurant looks like the sort of place you’d find in Shoreditch, but hooray, it’s in Dorset. Brassica was launched by chef Cass Titcombe, who co-founded the Canteen chain in London (one of my favourite haunts). It prides itself on serving good value, modern European food and that’s exactly what it does. I chose the prix fixe menu (£19 for three courses) and a treat was in store. I started with bruschetta with borlotti beans and chorizo, then went for the orecchiette with courgettes, ricotta and pecorino and finished with a sublime orange, almond and polenta cake. The service is friendly and professional and the décor is simple, pretty and stylish. I can’t think of a lunch in recent times that I’ve enjoyed more. 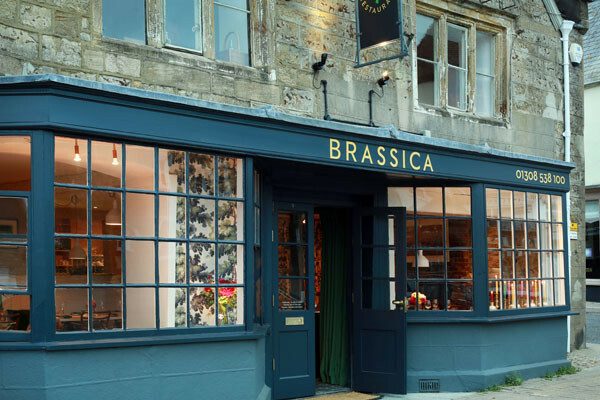 To add to the delight, there’s a brilliant shop next door – a sister business called Brassica Mercantile. You only have to step inside to see that co-owner Louise Chidgey has a wonderful eye for eclectic, stylish china, storage baskets, books, clothes and bags. The shop also sells items I spotted in the restaurant: the same china, cushions, olive oil and even orecchiette, just to mention a few. I wasn’t in the least surprised to discover that Louise used to be a senior buyer at The Conran Shop. Incidentally, if you haven’t got plans to visit Dorset any time soon, the shop does mail order. We finished the day with one of my favourite walks along the coastal path above Ringstead Bay. My alarm at what lies in store for the UK hasn’t gone away but thanks to Brassica and the stunning Dorset landscape it abated for a few hours.